When a home or property owner in Michigan is considering getting their water from a well, it’s a good idea to understand the basics of how it will be constructed. This includes some of the precautions that are taken to ensure a proper drill. Here’s what you need to know about the work being performed so you can avoid a malfunctioning well and a loss in your investment. Once the location of the well has been determined and all applicable permits have been approved, the drilling contractor will start the process using their drilling equipment. One of the first and most important steps to take is to ensure that the drilling machine is level. This is accomplished using outriggers, which act like long feet that extend from the drilling machine. These outriggers ensure that while the drilling is taking place, the direction of drilling will be straight down and not at an angle. Failing to ensure that the well is straight will lead to further complications. Once the machine has been set up and leveled, the drilling can begin. Large shafts start the drilling process. Here, a bit spins and a hammering action is applied to push through the ground. In most cases, the goal is to reach bedrock. However, depending on the specific geology of the site, there may be some “overburden.” Overburden can consist of various things, including sand, gravel, and clay. As the bit pushes deeper into the rock, water and air are pumped down. The water acts as a coolant, to ensure that the bit does not overheat from the friction of the bit rubbing against the rock. The compressed air along with the water helps push the broken pieces of rock to the top of the well, in order to avoid jamming the hole. As drilling continues, the shaft is elongated. A shaft will vary in length, but each section will be roughly 20 feet in length, including a male and female threaded end. The threaded ends allow the shafts to be fixed together, which allows drilling to continue deep below the surface until bedrock is reached. Once the drilling contractor hits bedrock, they will drill a bit further into the bedrock, and then install a casing. A casing is a large pipe (sometimes made of steel) that is installed down the shaft. One of the main purposes of the casing is to ensure the structural integrity of the well. Because the well is drilled through the overburden which can consist of various materials, the casing will serve to ensure that the well does not cave in. Once the casing is installed, grout is poured on the outside of the casing. This is to ensure the casing stays in place and that surface water does not flow into the shaft and contaminate the well water. After the drilling phase has been completed and the casing is cemented into the ground, the pump is installed. Now, the property owner will have access to groundwater and will be able to use it in their home or for any irrigation requirements. 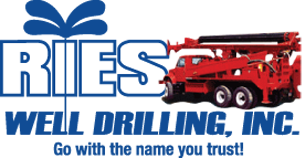 If you’d like to know more, get in touch with Ries Well Drilling. 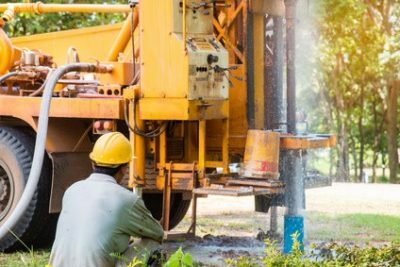 We provide water well installation, repair, and maintenance services to anyone looking to find a better water source. Give us a call today.